The ACCC makes statutory decisions through the Commission, aided by specialist subject matter committees (see table 4.3) composed of sub-groups of Commissioners. The AER makes its decisions through its board. The agencies are governed and their administration oversighted by corporate governance committees. 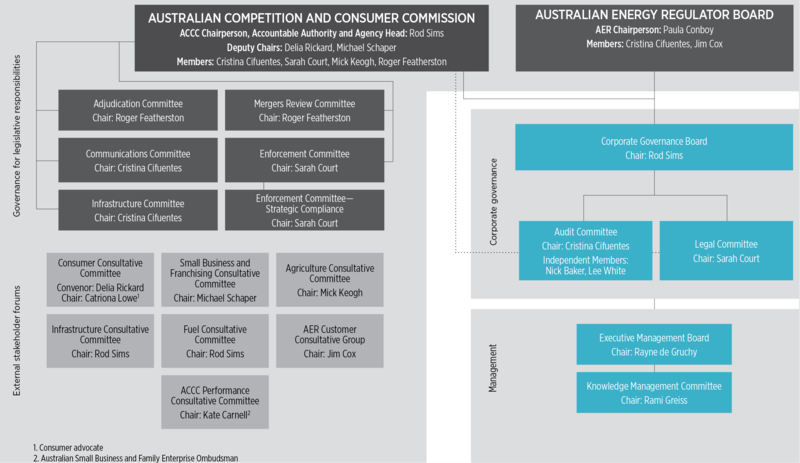 The ACCC and AER governance structure is shown in figure 4.1. Roger Featherston (Chair), Sarah Court, Delia Rickard, Michael Schaper, Rod Sims, Mick Keogh (for agriculture issues)—considers authorisation applications, notifications and certification trade marks and refers recommendations to the Commission for decision; meets weekly. The Adjudication Committee sits as a division of the Commission under s. 19 of the Competition and Consumer Act 2010 (Cth) (the Act) in respect of certain non-merger matters under Part VII of the Act. Cristina Cifuentes (Chair), Roger Featherston, Delia Rickard, Rod Sims, Mick Keogh (for agriculture issues)—considers telecommunications industry regulatory issues and refers recommendations to the full Commission for decision; meets fortnightly. Sarah Court (Chair), Roger Featherston, Delia Rickard, Michael Schaper, Rod Sims, Mick Keogh (for agriculture issues)—oversees ACCC actions to ensure compliance with and enforcement of the Act and refers recommendations to the Commission for decision; meets weekly. Sarah Court (Chair), Delia Rickard, Michael Schaper, Rod Sims, Mick Keogh (for agriculture issues)—considers emerging compliance issues and the ACCC’s response, including engagement with industry stakeholders and media communication; meets fortnightly. Cristina Cifuentes (Chair), Sarah Court, Jim Cox, Mick Keogh (for agriculture issues), Michael Schaper, Rod Sims—oversees access, price monitoring, transport and water regulatory issues; meets fortnightly. Roger Featherston (Chair), Sarah Court, Rod Sims, Mick Keogh (focused on agriculture issues)—considers merger reviews and refers certain recommendations to the Commission for decision; meets weekly. The corporate governance of the ACCC and AER provides oversight of the agency’s planning, performance, financial management, resource management and accountability. The Corporate Governance Board meets 10 times each year (generally on a monthly basis) and sits at the apex of the governance structure. All ACCC Commissioners and AER Board members are part of the Corporate Governance Board. The Audit Committee and Legal Committee support its work. The Corporate Governance Board, aided by these committees and by senior management committees, is well equipped to oversee our strong corporate and financial performance. Members: Rod Sims (Chair), ACCC deputy chairs, Commissioners, AER Chair and board members. the adequacy of the agency’s governance arrangements. Members: Cristina Cifuentes (Chair), Nick Baker (independent member), Lee White (independent member). assist and advise the Corporate Governance Board accordingly. The committee reviews legal and enforcement resource implications and provides greater accountability around the tracking and forecasting of legal expenditure over the life of ACCC and AER investigations and court proceedings. This committee also reviews the agency’s compliance with external obligations such as the Legal Services Directions 2017, and ACCC and AER input into policy processes affecting agency legal services. Members: Sarah Court (Chair), Chief Operating Officer, senior managers. Supporting the corporate governance committees, the ACCC has a number of management committees that operate to ensure the effective management of the organisation. The Executive Management Board manages the organisation in line with the expectations and limitations set by the Accountable Authority (the Chairman) and the Corporate Governance Board. Members: Chief Operating Officer (Chair), Chairman, Executive General Managers, Chief Information Officer, Chief Financial Officer, General Manager People and Culture, General Manager Strategic Communications. The Information and Knowledge Management Committee provides advice on information and knowledge management along with the enabling ICT to aid in decision-making that ensures the ACCC’s alignment and compliance with the ACCC’s strategic direction, government policies, Australian law and legal standards. Members: Executive General Manager Merger and Authorisation Review (Chair), Chief Information Officer, senior management from AER, Enforcement Division and Infrastructure Regulation Division, staff from Merger and Authorisation Review, Legal and Economic, Consumer, Small Business and Product Safety, People & Corporate Services divisions, one external independent advisor. The ACCC and AER Corporate Plan 2016–17 meets the requirements of the Public Governance, Performance and Accountability Act 2013 (PGPA Act) and our obligations under the Regulator Performance Framework. Our Corporate Plan is available on the ACCC website. We will continue to refine our corporate and business plans to best share our performance with parliament and the community. This annual report describes the outcomes against both the portfolio budget statements and the Corporate Plan. The ACCC’s internal audit function provides assurance that we are meeting our obligations and adds value to the management and governance of our operations. The agency’s Internal Audit plan was substantially revised in 2015, creating a forward program for the 2015–19 financial years. This plan is reviewed annually with the oversight of the Audit Committee and is approved by the Corporate Governance Board. Risk management is a key element of our strategic planning, decision-making and business operations. In accordance with the PGPA Act, the Commonwealth Risk Management Policy and Australian National Audit Office (ANAO) and Comcover better practice guides, the ACCC has a risk management framework to support the effective management of organisational risk. This framework covers the agency’s strategic risks, as well as agency-wide and operational risks that sit across and within the agency’s business units. The framework, which was substantially reviewed in 2015, includes risk management policies and guidelines that communicate accountabilities, responsibilities and expectations of all employees in ensuring the management of risk across the organisation. The ACCC and AER aim for best practice in controlling all risks by identifying priority exposures, addressing them through improvement strategies and contingency planning, and monitoring and reviewing ongoing risk. Business continuity management strengthens business resilience, lessening the likelihood of incidents that may adversely affect ACCC and AER operations, and minimising the impact if such incidents occur. During 2016–17 the agency completed a substantial review of its business continuity framework and plan to ensure that it remains contemporary and able to support the ACCC’s and AER’s continued operations. This review included a test exercise in December 2016. Following this review, the revised Business Continuity Plan was finalised and communicated throughout the organisation. Ongoing reviews and testing will ensure the plan continues to meet the business continuity needs of the agency. The ACCC and AER has a Fraud Control Plan for 2017–19 that directs the agency’s approach to fraud prevention, detection, investigation, reporting and data collection procedures that meet our specific needs and comply with the PGPA Act and the Commonwealth Fraud Control Guidelines. This plan was revised in 2016 and finalised for the next three years. The ACCC and AER had one reported instance of possible fraud in 2016–17. The Fraud Control Officer conducted a preliminary internal investigation then engaged an external investigator to conduct an independent fraud investigation. The independent fraud investigation found no evidence of either internal or external fraud. The ACCC is required to report annually on its environmental performance under the Environment Protection and Biodiversity Conservation Act 1999, and has nominated to report on the organisation’s performance internally on an annual basis. The agency adheres to the Energy Efficiency in Government Operations Policy, the Australian Government ICT Sustainability Plan 2010–2015, and the National Packaging Covenant, using recommended key performance indicators (KPIs) to meet requirements. The ACCC remains committed to the development of best practice in environmental sustainability and performance. Our environmental policy includes strategies to improve sustainability and performance consistent with the Australian Government ICT Sustainability Plan 2010–2015 and better practices outlined by the ANAO. We maintained our steady progress in environmental policy performance in 2016−17 by achieving 11 of 17 KPIs, or 65 per cent, with key improvements to data collection and recording methods increasing accuracy in reporting. Our overall performance has improved by more than 47 per cent since the inception of the reporting program in 2011−12, when only three of 17 KPIs were met. The ACCC and AER are proud of their ethical standards and ensure there is continued public confidence in their integrity and that of their staff. Given that we often investigate misrepresentation of information or unconscionable business conduct and determine charges that impact on cost of living, it is vital that we maintain the trust of the Australian people, government and businesses. To maintain confidence in our integrity, the ACCC and AER have strict procedures to identify and properly manage any personal interests that may cause an actual or perceived conflict of interest. As statutory office holders, Commissioners and board members are held to high standards of conduct. These standards arise from the high ethical standards we set ourselves and are backed by legislation, codes of conduct and the common law. ACCC members must provide the Chairperson with an annual statement of material personal interests and not participate in matters in which they, or a member of their direct family, may have a real or perceived conflict of interest. ACCC members are also required to disclose interests not previously declared at Commission and committee meetings. AER Board members are required to disclose conflicts of interest at a board meeting. During 2016–17 the ACCC and AER implemented an updated conflict of interest policy. The policy provides for all conflict of interest action to be recorded using a suite of online forms. Conflict of interest action requires a self-assessment and, where a conflict is identified, disclosure of the conflict and a plan to manage the conflict. The policy also provides for reporting on completion of the conflict of interest to senior management. As a general rule, ACCC Commissioners, AER Board members and staff cannot accept gifts and hospitality, because acceptance could compromise, or be seen to compromise, the organisation’s integrity. In limited circumstances, employees are able to accept gifts such as chocolates or wine if they are related to their participation at a conference or received from a foreign delegation. To ensure transparency, a $50 minimum threshold is in place for formal declarations. This allows us to display a high level of integrity and ethical behaviour in our day-to-day work. The ACCC and AER are committed to driving a respectful culture throughout the organisation and upholding and promoting the behaviours specified in the Australian Public Service (APS) Values and Code of Conduct. Employees learn about the APS Values and Code of Conduct in corporate induction sessions, and additional awareness training is incorporated into leadership programs. Alleged misconduct by employees may be dealt with under the APS Code of Conduct. In 2016−17, the ACCC/AER did not investigate any potential breaches of the code. agencies with administrative oversight, including the Commonwealth Ombudsman. These bodies have the power to review our decisions or work, investigate them and either uphold the decision of the ACCC or AER or order or recommend that the ACCC or AER make changes if necessary. Each year the ACCC reports on its interaction with these bodies to ensure transparency on external scrutiny. On 7 October 2015, the ACCC made final access determinations (FADs) in respect of seven fixed line services supplied by Telstra Corporation Limited (Telstra). On 5 November 2015, Telstra filed an application for judicial review of all of the relevant FADs. Telstra was seeking an order quashing or setting aside these regulatory decisions. On 28 March 2017 the Court dismissed Telstra’s application. There were no decisions by the Administrative Appeals Tribunal in respect of decisions made by the ACCC or AER in 2016–17. One application for review was made to the Office of the Merit Protection Commissioner in 2016–17, which upheld the ACCC’s decision. No requests for freedom of information review concerning the ACCC were lodged with the Office of the Australian Information Commissioner in 2016–17. The Privacy Commissioner did not investigate any complaints about the ACCC/AER in 2016–17. The Australian Competition Tribunal (the Tribunal) reviewed two decisions of the ACCC or AER in 2016–17. It made one decision in respect of related energy decisions made by the AER. In October 2015 the AER made a decision which set the maximum amount of revenue that SA Power Networks (SAPN) could recover from consumers over a five-year period (the 2015 revenue determination). SAPN sought merits and judicial review in the Tribunal and the Federal Court respectively. The South Australian Council of Social Service also applied to the Tribunal to review the AER’s revenue determinations, but leave was not granted. On 28 October 2016 the Tribunal handed down its decision. The Tribunal did not accept any of the grounds of appeal raised by SAPN, dismissing SAPN’s application and affirming the AER’s decision. On 25 November 2016, SAPN filed an application for judicial review of the Tribunal’s determination in relation to the value of imputation credits, the cost of debt and labour cost escalation. The Full Court heard this matter in May 2017. The Court’s decision is currently reserved. Applications for leave and review of the AER’s electricity distribution determinations for CitiPower, Powercor, United Energy, Jemena and AusNet Services; and review of the AER’s gas distribution determination for ActewAGL were lodged on 17 June 2016. The merits review hearings concluded in November 2016. The Tribunal has extended the time for making its decision until August 2017. In April and June 2015, the AER made five decisions which set the maximum amount of revenue that electricity and gas distribution businesses in New South Wales and the Australian Capital Territory could recover from consumers over a five-year period (the 2015 revenue determinations). The five distribution businesses sought limited merits review of the 2015 revenue determinations in the Tribunal. On 26 February 2016 (for electricity) and 3 March 2016 (for gas) the Tribunal handed down its decisions to set aside the 2015 revenue determinations for the New South Wales and ACT electricity and gas businesses. The Tribunal remitted the decisions to the AER, directing it to remake its decisions in relation to the rate of return on debt that could be earned by the businesses, the value of imputation credits and the allowances made for operating expenditure. On 24 March 2016, the AER filed five applications for judicial review in respect of each of these Tribunal determinations. The Full Federal Court handed down its decisions on 24 May 2017. The Court allowed the appeal in relation to the value of imputation credits but upheld the Tribunal’s findings in relation to operating expenditure and the cost of debt. The ACCC appeared before the House of Representatives Standing Committee on Economics on 24 October 2016 as part of the committee’s review into the ACCC’s Annual Report 2014–15. Topics covered included competition in the financial services sector and the effects test in s. 46 of the Act. The Committee’s report following the review was tabled on 21 November 2016. The Independent Review into the Future Security of the National Electricity Market was completed in June 2016, with the final report delivered to the Council of Australian Governments (COAG) Energy Council. The review made a number of recommendations directly relevant to the AER’s work and how it functions as the regulator. COAG is now considering the recommendations from the review. From 2017–18 the AER will receive additional funding which will ensure it is equipped to meet the challenges of its expanded roles and functions. Agencies operating under the Freedom of Information Act 1982 must publish information for the public as part of the Information Publication Scheme. This requirement has replaced the former requirement to publish a statement in the annual report. Each agency’s website must include a plan that shows the information it publishes in accordance with the scheme’s requirements. See the ACCC’s freedom of information website for our plan. The ACCC and AER each have service charters stating the standard of service you can expect to receive from us. The service charters are available from the ACCC and AER websites respectively. During 2016–17 the government directed the ACCC and AER to undertake a number of new assignments. Resourcing both these and normal business functions required a substantial movement of existing employees and the engagement of new people. The scope of this recruitment was possibly the largest the agency has undertaken and required a holistic, organisation-wide approach and innovative recruitment methods. The recruitment campaign facilitated over 100 recruitment outcomes and established a merit pool of suitable people that support future recruitment needs. Throughout 2016–17 we actively worked to increase the number of women in our senior leadership positions, and our numbers of people with a disability and people from Indigenous backgrounds. Our entry-level programs (graduates, interns and specialised diversity programs) made significant progress, increasing the representation of talented Indigenous and disabled people. During 2016–17 the ACCC and AER piloted a new approach to performance management based on continuous feedback and no ratings. Three branches were supported by an external facilitator as they trialled a new program which focused on establishing goals relating to team, work and self. Early evaluations of the program indicated more effective performance conversations and improvements in team relationships. The lack of performance ratings associated with the new program was seen as a benefit by managers and employees as it allowed for a stronger focus on conversations on how employees are developing and how they do their work. Following the success of the pilot, the ACCC and AER will roll out the new program over the next 18 months.